I think I remember calling my twins’ first illness “a cold” in my last post. As in, just a cold. Some sneezing and sniffles, nothing a mom can’t handle, right? Well. Not 10 minutes after I published that post on Saturday night, Lil C woke up crying. When I went up there, I found she couldn’t take her pacifier because she couldn’t breathe through her nose. While B lay in his crib a few feet away, I tried suctioning out C’s nose which not only didn’t work, but made her cry louder. Then I panicked, thinking she might be in some pain, and gave her Tylenol, which in my arms, she projectile vomited that and her bedtime bottle of 9 ounces all over the babies’ floor. With C now really crying, my husband is trying to clean up the milk/Tylenol mess because the Tylenol is RED, and the carpet is TAN. (Ah, that’s why we should’ve chosen a darker color rug) He’s using a flashlight to scrub, C is screaming and now B’s awake, crying as well. I’m COMPLETELY covered in vomit. Good times. And she was up all night, coughing and gagging on what was dripping down her throat. 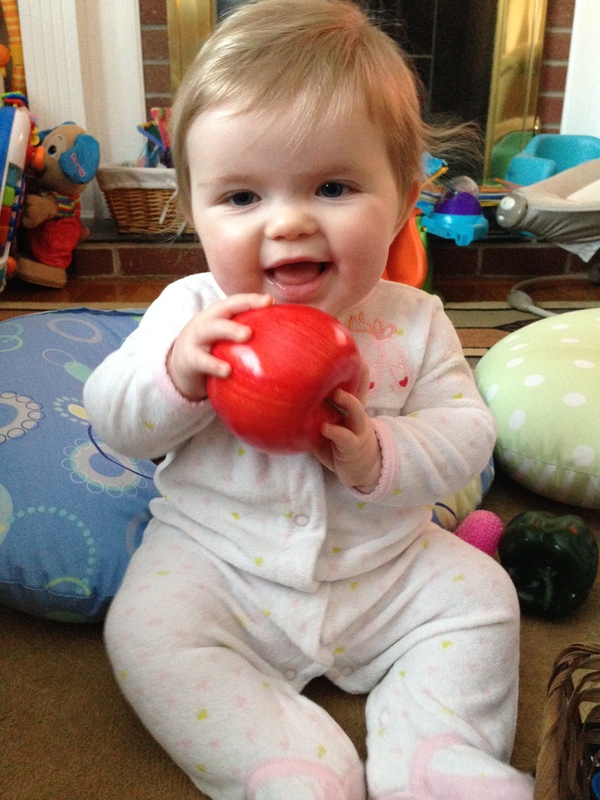 Now, a few days later, we are skipping playgroup but slowly on the mend. 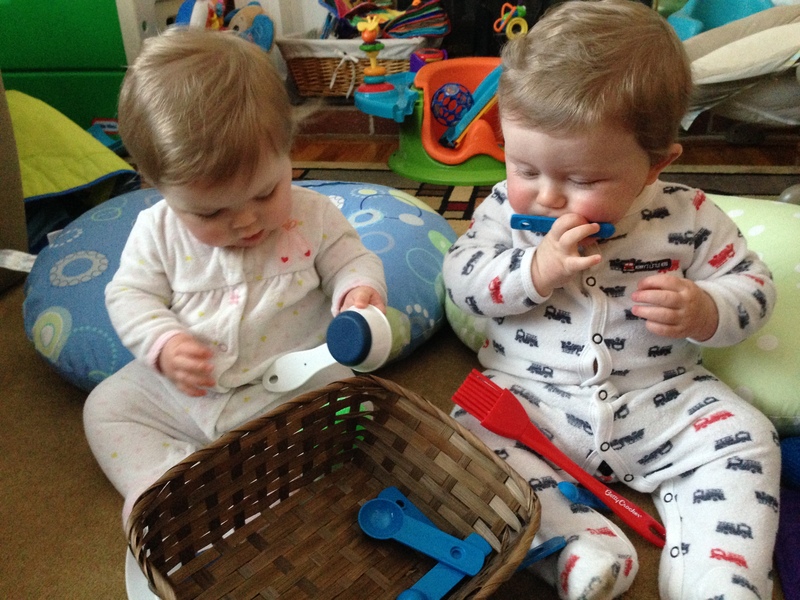 Still lots of mucous of all colors, stuffy, coughing, terrible sleep – these babies are a mess. What little cold was I thinking of? Two nights ago, I found that C could breathe better if she were straight up and down. Elevating the mattress wasn’t enough. So I pulled up a rocking chair in the next room, and we snuggled in for the night. I got no sleep, but C was breathing better. Last night, she luckily was okay in her crib. Anyway, this isn’t a little cold by any means. It’s so hard to see your babies suffering and being so sad. There wasn’t any fever though, just strictly a nasty cold with lots of tears and yuck. And of course, all four of us have this cold now. In the future, I’m wondering how parents possibly avoid getting whatever illness their children have. I don’t think it’s possible – especially with babies who need to be held and snuggled. So we all feel crappy. I’ve been working on this one for a while. 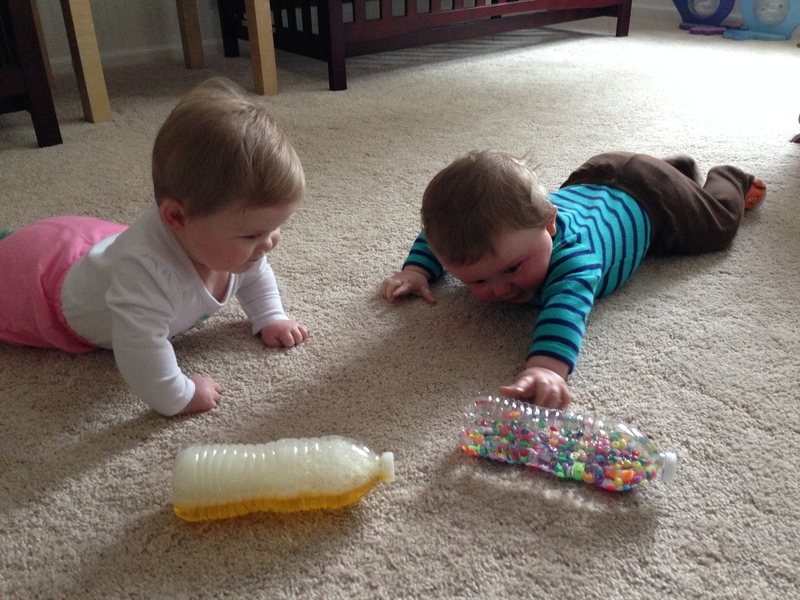 For a cheap set of toys for babies or toddlers, sensory bottles are a great way to change up what your child plays with every day. 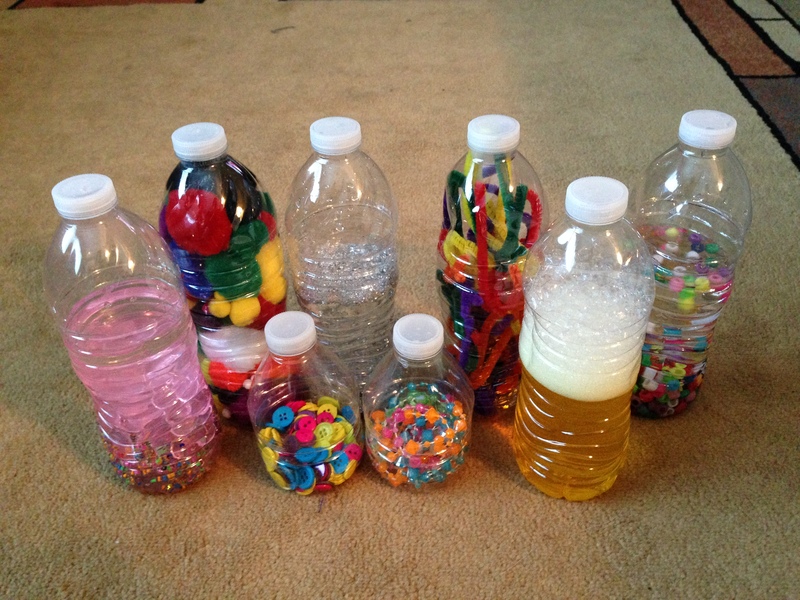 You can be really creative, make many bottles, or just a few, but it’s so easy to do. First, I collected water bottles. 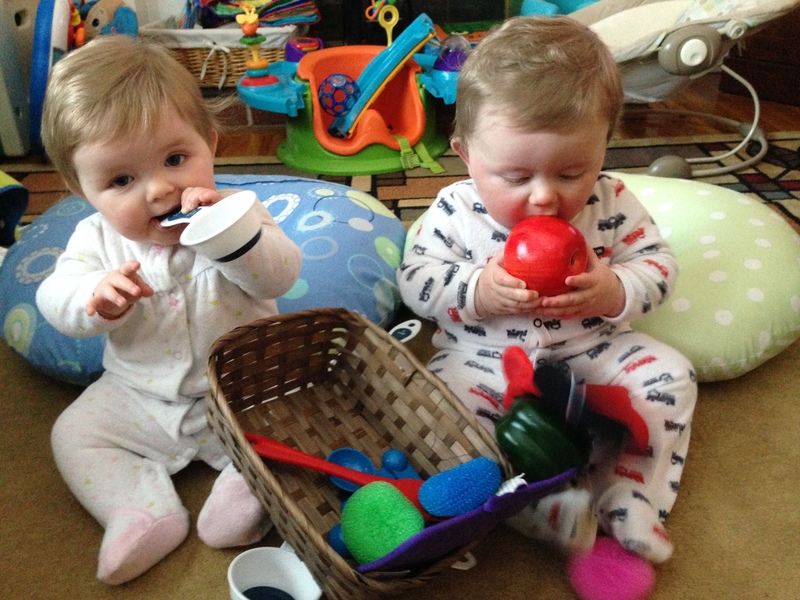 We only had the larger, standard size at the time which is fine for older babies, but the younger ones can grab onto the smaller bottles easier. After washing the bottles and caps and letting them air dry, I filled them with an assortment of items I either had around the house or bought at the dollar store. Some have water added and some do not. I super-glued the caps on, and I keep them in a basket. SO easy! *Another great one that I haven’t yet made is ripped up pieces of tin foil – so shiny! Again, you can be creative or not, add whatever you’d like, but the idea is to stimulate the different senses. I have a few bottles that make loud noises when you shake them, a few that are great for future color identification or counting, and a few that show slow movement and are great for visual stimulation. So far the babies love to shake the two smaller bottles, and hold onto/look at/try to eat the bigger bottles. Part of my reason for making some of my own toys is that I can keep them for years and use them for different purposes as the babies get older. Right now, they’re all about making the bottles crackle and looking at the colors and shine, but in the future I’m hoping to use the bottles for counting, rolling, and that sort of thing. What I like most about this idea is that you can store these baskets away and bring them out on a rainy day or when the babies are fussy. Or, in this case, on our Sick Day when we need a pick-me-up. 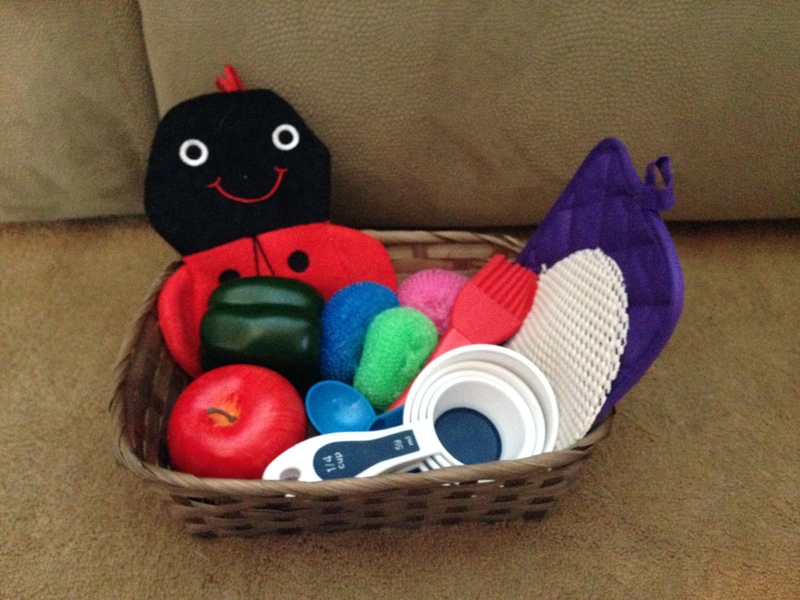 Using cheap baskets from the dollar store, I filled one with regular items from around my house that are safe for babies. 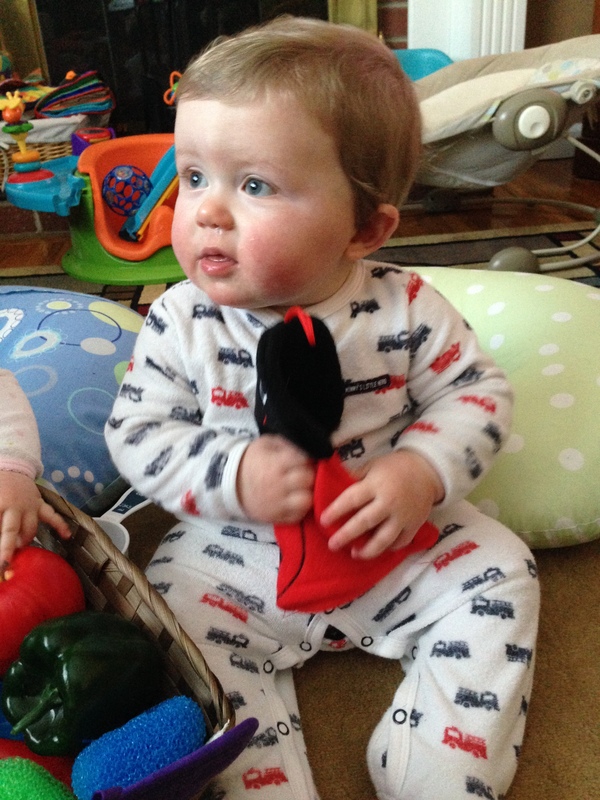 We have so many light up, sing-song toys in our house that are great but also do the work for the babies. 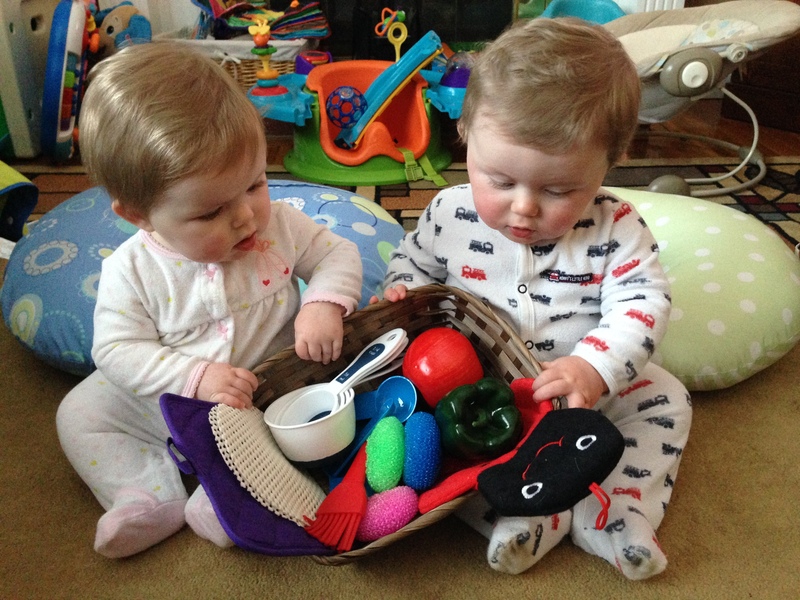 Treasure baskets are supposed to be for exploration – you put in items that aren’t toys, giving children the opportunity to feel and discover different materials. I’ve only made one basket so far, but I’d like to make a few with different themes. The Imagination Tree shows baskets full of wood products (like a wooden spoon, wooden blocks, etc), soft textures, crinkly textures, and so on. This basket has a variety of items from around my house but not with any theme to it. As you can see, there is a pot holder (clean and new 🙂 ), a bath mit, two fake foods, measuring cups and spoons, etc. I gave this basket to the babies for the first time and it kept them happily engaged for a good half hour, which in baby time = forever. Checking out the basket for the first time.. They seemed to really enjoy the contents of the basket. And it was great for their fine motor development, as they had to use their fingers/whole hands to pick up oddly shaped items. For the first time, I witnessed C with something in her right hand but an item on her right side she wanted to grab. She transferred what was in her right hand to her left, and then grabbed the object on the floor. Treasure baskets are awesome for different textures and sizes. As the babies get older, you can still use these for toddlers but can switch out any of the items for things that might be more appropriate for their level. With sick babies who only took a half hour nap (ugh) this is all I’ve got time for at the moment! 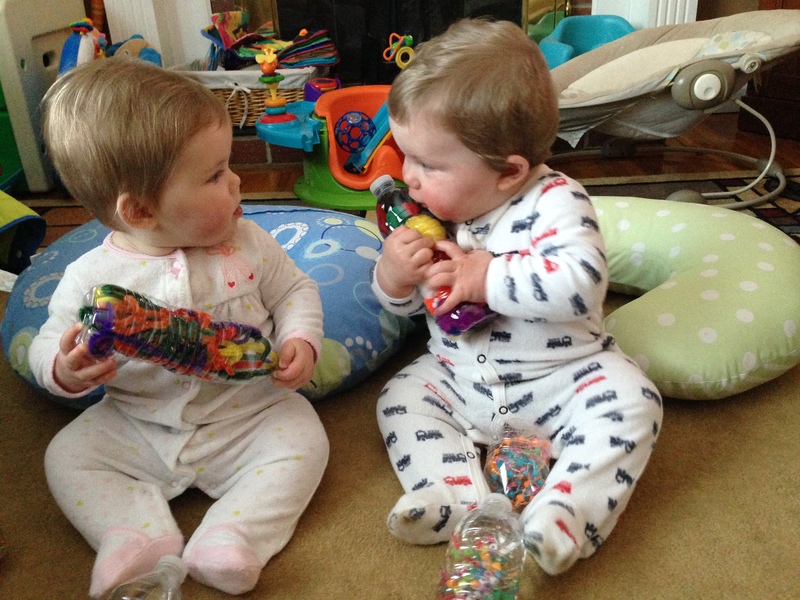 I’m hoping to make more toys – it’s very satisfying for me and good for the babies. Thanks for sharing! This is super cool. Can’t wait to try. Oh, hope they feel better soon! That sounds like a bad night 😛 The treasure baskets and bottles look so fun! Great idea. I’m going to try something like that. Yeah, it wasn’t pretty! Thanks!! I love homemade toys too! Easily accessible, cheap and endless fun! 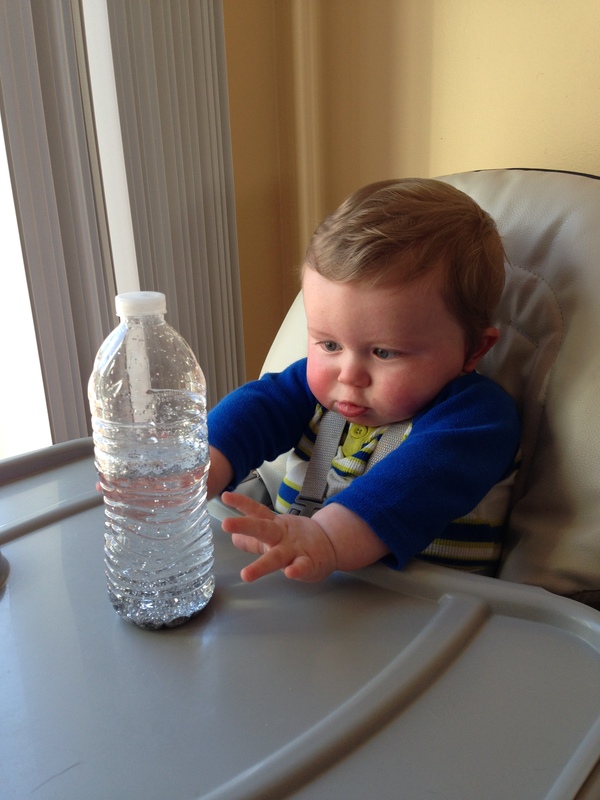 I only did a colored water bottle (with maybe something in it once or twice), but these days my boy knows how to unscrew the tops…no more bottles with small stuff in them anymore. lol. But we’ve given him old vitamin bottles with hair clips or something for noise makers (before he could open them), kitchen containers, plastic/wooden spoons, (news)paper (but we made sure to keep it out of the mouth as much as we could), Altoid tins and tons more. Right now, he’s loving uncooked pasta with some measuring cups and containers to pour it back and forth in. Plus, we all have to wear aprons while he is doing this. *grin* Home(made) stuff is tons of fun! Fantastic ideas. I am going to make some of these this weekend, my daughter will love them, especially the bottles with glitter… thanks for sharing!